Ethernet provides a cost-effective shared storage solution for small-to-midsize media production studios. Though 10GbE continues to play an important role in 4K workflows, new formats such as 8K require additional	bandwidth. To future-proof your environment for new production formats, a more robust, low latency	connectivity technology is required, one fast enough to handle multiple uncompressed 8K video streams. 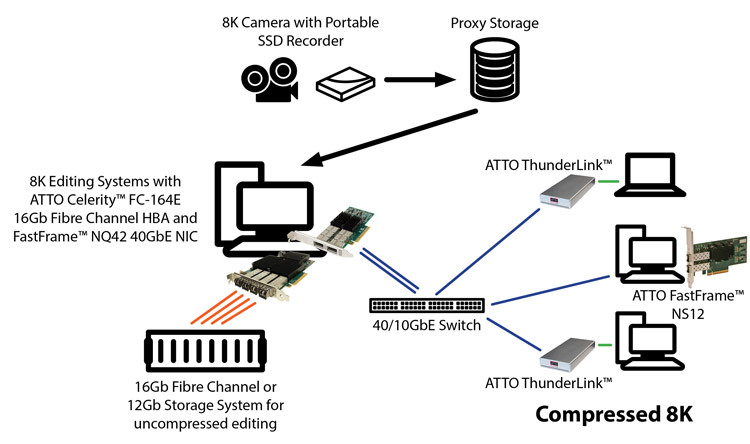 The industry-leading latency and throughput of ATTO's FastFrame 40GbE NICs enables high performance applications	such as uncompressed 4K and 8K video workflows. A single stream of 16-bit 8K EXR video at 24fps requires	28.2Gb/s of bandwidth. Although that need can be met by teaming or bonding multiple 10GbE ports, using a	single port on a FastFrame 40GbE NIC provides a more cost-effective, power-efficient solution. While most competing 40GbE NICs on the market perform at less than 30Gb/s, FastFrame NICs achieve near-line	rates on 40GbE — enough to support even uncompressed 8K. The unparalleled throughput of FastFrame 40GbE NICs	is made possible by its implementation of Remote Direct Memory Access (RDMA) over Converged Ethernet (RoCE),	a feature that uses zero copy data transfers to permit more efficient data movement between servers and storage,	freeing up the host's CPU for editing, compositing and rendering. RoCE is already a standard in latency-sensitive	markets such as high performance computing clusters (HPCC), and is seeing increased adoption in editing workflows	due to its latency and CPU utilization benefits. With Energy Efficient Ethernet and RoCE support, ATTO 40GbE NICs offer higher ROI than competitors by ensuring	the maximization of resources and minimization of OPEX. Upgrade to 40GbE and be 8K-ready.